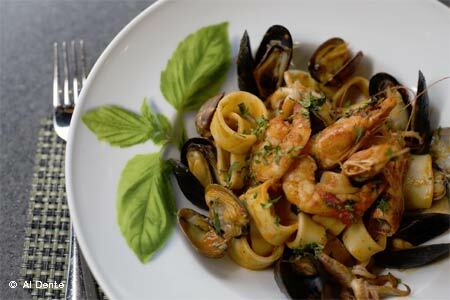 : Al Dente showcases chef Roberto Donna’s extravagant Italian cooking, from the pork belly and polenta fries to the salted cod with grilled bread and the roasted red peppers that melt on the tongue. These just initiate a lavish meal, which, if your waistline and wallet can hold up, will take you through sweet and savory pizzas. Donna’s famous handmade pastas --- try the gnocchi with pork sausage ragù --- are preludes to the serious stuff, the entrées that include braised pork shank, hanger steak with broccoli rabe, and beef short ribs with a Parmigiano-Reggiano potato purée. Less elegant mains may catch your fancy, and these would include a round of spiedini di salsiccia, or hand-made sausages on skewers. Imagine a duck sausage grilled with shallots, apples, peppers and polenta. While you are dipping into the endless bread basket, keep uppermost in your thoughts what to select for dessert. While Donna does offer lighter classic Italian sweets, no one should pass up his Al Dente tiramisu, boasting mascarpone mousse and coffee caviar drops. For smaller appetites, you can always select the panna cotta, Italy’s classic and rich dessert of “cooked” cream or chocolate salami. At your discretion, they are paired with dessert wines. Not surprisingly, the cocktail and wine lists are strongly Italian.